When Val and Violet Mazzuca became owners of the Hanmer Valley Shopping Centre, a small strip mall in Hanmer on Highway 69N, on March 29, 1971 , they had a dream that it would one day become a major shopping center for the surrounding communities. On March 30, 2005 , they celebrated the 34th Anniversary of their ownership by seeing their dream fulfilled. On that memorable day, Valentino Mazzuca, shown on the far left in the photo, and Violet Mazzuca, shown on the far right, cut the ribbon to officially open the Hart Department Store at the Hanmer Valley Shopping Centre. Officials from the store holding the ribbon were Rod Groulx, Store Manager; Michael Hart, President and CEO of Hart Stores Inc., and; Michel Lussier, Director of Store Operations. The photo was provided by Ron Gladu Photos. 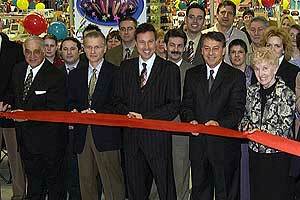 We all know that ribbon cutting ceremonies are common. But this one was different. And anyone who experienced the moment will tell you that they could “feel” something special was about to take place. You could sense that this was not just the opening of another store. It was the beginning of a new era in the history of Valley East , and it was about to launch the Hanmer Valley Shopping Centre to a whole new level as a major retail establishment. Over 2000 shoppers anxiously awaited the cutting of the ribbon at 9:30 a.m. on March 30. It was the biggest, most remarkable grand opening in the history of the 68-store company, blowing away all previous records for attendance and sales. Thousands of shoppers have continued to pour through the doors of the store which is quickly becoming recognized as the “missing link” for which Valley East and Capreol shoppers have been searching. As people of all ages come from all corners of the Sudbury region on a mission to see the new store that everyone is raving about, they are also discovering why the Mazzuca’s are so very proud of the Hanmer Valley Shopping Centre. They are finding that this is the cleanest mall they have ever seen. They are finding that this is a family-friendly mall with plenty of children’s rides to entertain youngsters; a community bulletin board section where they can find out what is happening in their town; a place where they can register for minor sports, and; a place which actually encourages people to drop in just to walk a few laps around the mall to keep fit. They are finding sitting areas with furniture you would expect to see in a living room and groups of friends socializing as if they were in a community center instead of a shopping centre. They are finding that from the moment they walk through the entrance to the mall they become immersed in an atmosphere where everything from the oldies music, the colours of the hallways, the decorations on the walls and the smiles from the store owners and employees blend together to lift their spirits and make them feel welcome and appreciated. Pam’s Deli is open from 7:30 in the morning to 9:00 p.m. each weekday so that you can always find a place to sit and relax with a light snack and a drink. Buddies Restaurant, one of the most popular eating establishments in the region, is open from 9:00 a.m. to serve all of your daily meals and refreshments. Stores open at 9:30 a.m. six days of the week, at 10:00 a.m. on Sundays. They stay open until 9 p.m. weekdays; 5:30 p.m. Saturdays; and 5 p.m. Sundays. Besides offering all of the goods and services that anyone could ever need under one climate-controlled roof, the Hanmer Valley Shopping Centre is going out of its way to provide only the very best for its customers. The first Monday of every month has been designated as “Senior’s Day” at the mall where shoppers over the age of 55 will be treated to 15% off retail products found in a wide variety of participating stores. In addition, merchants throughout the mall are proud to declare that they stand by their prices and are willing to match competitor prices on most products in their stores. They want local residents to know that if they see something they want at the Hanmer Valley Shopping Centre, it is going to be the best price around. Now they can shop in the Valley first to save money on gasoline and time that would be wasted stuck in traffic in Sudbury .